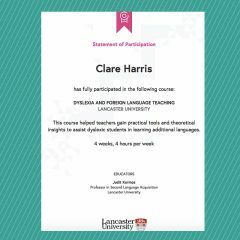 I scrambled my way through the last two weeks of Dyslexia and Foreign Language Teaching – late with my assignment, very aware of what it means to add study to an already busy life. Each small section invited reflection and comment – and as I mentioned in my thoughts from week 1, sometimes there would be more than 400 comments to read… and I wanted to read them all, to join the discussion where I could. Was it all relevant? Well, a lot of participants were teachers in a school, or teaching a foreign language, or working with learners with a clear SpLD diagnosis, but there were plenty talking about how something might apply in an adult ESOL context – and how much everything related to ALL our beginner learners. Great course, so worth doing. As with all good PD, it made me feel energised (though a bit frantic). I’ll be really looking out for learners who seem to be struggling, and take a much closer look at the organization of their files, their L1 writing and reading. I’ve caught up with our Disability Officer, and got some useful tips from her (more on that later). I’m also going to take a closer look at the ‘Guide on Reasonable Adjustment’ for CSWE. I’m being much more consistent with all those things I already know are part of good multisensory teaching: we are standing up much more, acting out, moving around, holding cards and working out which order we should stand in. I’m using coloured pens to show different sounds, parts of speech, and checking everyone understands the mouth position/speech organs for different sounds… I know, it’s nothing new, just remembering to do it! I’ve realized that I really don’t know enough to have a whole page about learning difference in the teacher notes in my books – instead I’ll include a few tips, then refer teachers to an ‘info’ page on my website, with all the good links I can find.